A soft, non-slip grip provides extra cushioning and absorbs pressure when you’re digging into compacted soil. This stainless steel tool has easy-to-read measurement markings to aid in planting at the correct depth. $9.00. Oxo, 800-545-4411 for store locator, www.oxo.com. Razor-sharp, serrated teeth cut through roots, weeds, sod, and even burlap and twine. 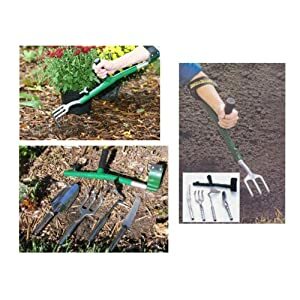 A welded handle provides good leverage for digging hard, packed soil. Includes a nylon belt holster. 12 inches long, with a 73/4 -by-13/4 -inch blade. $35.99. Duluth Trading, 800-505-8888, www.duluthtrading.com. Sufferers from carpal tunnel syndrome and arthritis will appreciate this ergonomically designed tool, which rests against the palm of your hand so your wrist remains in a natural position. Made of sturdy, lightweight resin. $16.95. Walt Nicke Co., 978-887-3388,www.gardentalk.com. The handle on the Softouch cultivator has a comfortable grip that’s designed to give you less hand and wrist fatigue. Made of one-piece, high-strength cast aluminum alloy. $5.00. Fiskars, sold at garden centers and retail stores, www.fiskars.com. This efficient tool is both a trowel and a cultivator. Made of solid cast aluminum, it has a molded-vinyl ergonomic hand grip. 171/4 inches long. $19.95. Gardener’s Supply, 800-955-3370, www.gardeners.com.